Spray 5- to 6-quart slow cooker with cooking spray. In 12-inch skillet, heat 1 tablespoon of the oil over medium-high heat. Sprinkle chicken with salt and pepper. Cook half of the chicken pieces in oil 4 to 6 minutes, turning once, until brown. Place chicken in slow cooker. Repeat with remaining 1 tablespoon oil and chicken pieces. 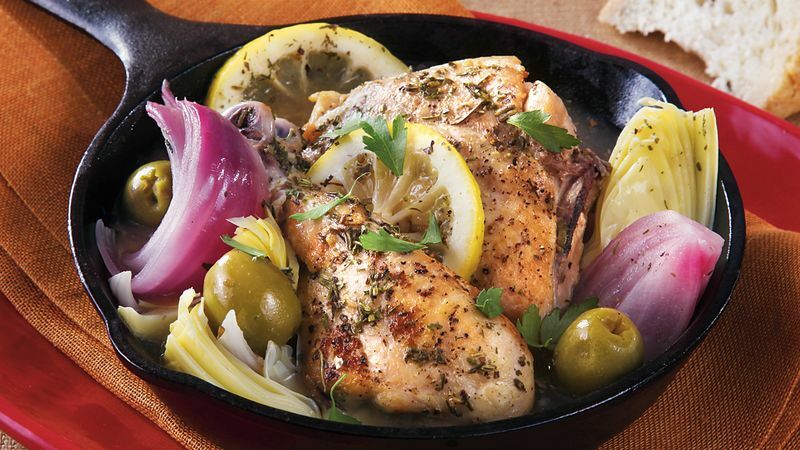 Add wine to skillet; heat to simmering over medium heat, stirring to loosen brown particles. Pour into slow cooker. Add lemon, garlic, onion and herbes de Provence. Pour broth over top. Stir artichoke hearts and olives into slow cooker. Cover; cook 30 minutes longer. Garnish with parsley.